Line Exhausters | Food Processing Equipment Athens | Dixie Canner Co. The Dixie M-2 Exhauster is shipped complete and ready-to-install. Just connect to a steam line and plug in the electric cord. It is equipped with filling and sealing tables 33″ x 33″ on opposite ends of the 12′ enclosed tunnel. The hood is easily removed for cleaning. The motor and 100-1 speed reducer are equipped with 3-step pulleys for variable speed adjustment. Guide rails are adjustable for all cans up to No. 10s. Perforated steam pipes extend the full length of the tunnel on both sides for effective exhausting. Motor 1/3 H.P., 115/60/1, 1725 RPM. All-stainless steel construction (except chain, sprocket, motor and speed reducer) resists rust and encourages sanitation. This equipment saves labor, eliminates “bottlenecks,” increases production and improves quality. 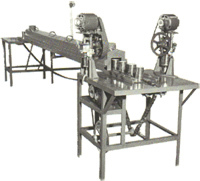 This shows Dixie Sealers mounted on sealing table and steam line connection. This exhauster is ideal for use with Dixie Sealers & Retorts and their operations guarantee smooth and efficient production and improved quality. Overall length 17′ 6″. All stainless steel construction except chain, sprocket, motor and speed reducer. Shipping Wt. 500 lbs., Export 1100 lbs., 177 cu. ft. 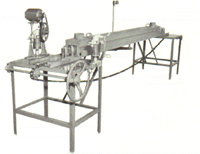 The Dixie M-1 Hand Operated Line Exhauster is ideal for smaller operations, laboratories, etc. Cans may be exhausted for desired length of time and then pulled from the tunnel – one at a time – for sealing. The exhauster is shipped ready for connecting to the steam line. Same quality construction as the M-2, except this model is hand-operated. Adjustable for all cans up to No. 10s. Tables 24″ x 33″ are at each end. 10′ enclosed tunnel with removable hood for cleaning. Overall length 14′. Shipping Wt. 450 lbs., 155 cu. ft.